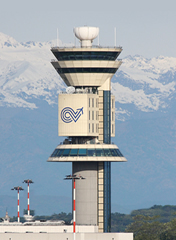 Milano Malpensa Airport "City of Milan", is Milan's largest airport. It is located 39.97 km northwest of central Milan, Italy. It is one of 3 airports in the city Milan metropolitan area. Madrid Barajas is the largest airport in Spain with more than 40 million passengers in 2006. Faro Airport is the most important airport in Algarve, it is seven kilometers west of the city of Faro. Amsterdam Airport Schiphol is the Netherlands' main and largest airport, located 20 minutes southwest of Amsterdam City.